Our Tidemaster condo is located in the heart of the Ocean Drive section of N. Myrtle Beach and is a quiet family beach. This beautiful three bedroom, three full bath unit has been tastefully decorated and repainted in January 2019. This beach home has about 1500 sq. ft and has been upgraded with granite counter tops and tiled back splash in the kitchen and tiled floors in the foyer, kitchen and all three bathrooms. The living room has a oversize custom made Sea Grass couch and 2 chairs with beautifully upholstered fabric. We have furnished the master bedroom with a king-size Bassett bedroom suite, and a queen-size Bassett suite in the second bedroom, and two full size beds in the third bedroom. Each bed has pillow top bedding for added comfort. With two full beds in the third bedroom, there is no more sleeping on a sleeper sofa. Also each bedroom has it's on full bathroom. For added comfort we have installed ceiling fans through out the condo. This home has a 40 Inch Flat Screen inch T.V. in the Living Room, 40 Inch Flat Screen in the Master Bedroom and 32 Inch Flat Screen cable color TV's in each of the other bedrooms. The condo also has several DVD players. There is a stereo system in the living room located in the entertainment cabinet. This unit is well above the average rental unit on the market today. The Tidemaster has a oversize swimming pool that is 8ft deep, unlike most pools that are now just 5ft deep. There is also a kiddie pool for the children, and there is a area for grilling out. This 2nd floor unit also has free wireless internet service, provided by CityWide Internet Services. The Tidemaster is located in the 500 block of South Ocean Blvd, in the heart of Ocean Drive in N. Myrtle Beach. We are within walking distance of all the annual SOS events, Car shows, and all city events in Ocean Drive. Most of the major restaurants, golf courses, and live shows are within a five minute drive of our home. The Tidemaster has just had renovations on the building and has, resurfaced parking lots, outdoor lighting, secured building (you need a code to enter the building) and other upgrades. The grounds have a newly landscaped look and the parking lots have just been repaved. Our property has only 54 units, so the Two High speed glass elevators provide for quick service. We have without a doubt the nicer rental units on the beach, and we work hard to provide a quality product. This is a very well maintained unit, and these units book fast, so reserve the week you want, not the week that is left over. * Rates do not include 13% South Carolina Sales and Accommodations Taxes. * Linen service as well as Travel Insurance Service is Available. * Refundable $200.00 Security Deposit. * Note: Please note rental rates are subject to change and may increase or decrease depending on availability. Existing reservations with a prepayment are excluded. My name is Tommy Sides and I have been offering oceanfront properties for family vacations since 1986. My trail & error experience over the years has provided me with valuable experience in the rental industry. I listen to my clients and I have very nice and upgraded properties that I am proud of. I am most proud of my repeat business, which let's me know that we are putting out a good product. This property is Location, Location, Location. We are in the Heart of the Ocean Drive section of N. Myrtle Beach and just a short walk to Main St and all of it's activites. You will also find this condo to be very spacious for a 3BR/3BA unit. The average 3BR is 1150 to 1250 square feet. My unit is about 1500 square feet with a 145 square foot oceanfront balcony. You will not find a 3BR unit anywhere in N. Myrtle Beach that each of the Bedrooms are almost equal in size to the Master Bedroom. Stay in this condo and enjoy the extra room. 1. Extra Square Footage. 2. Close to Main Street and all of the Activites. 3. Shopping & Grocery Stores on the East side of Hwy 17. 4. Wide Beaches with Low Denisity Housing (only 54 units). 5. Close to Main St Connector, which connects to Hwy 31 & 22. By-pass all the traffic lights on Hwy 17 by using this route. toilet, combination tub/shower, Master Bath has new vanity cabinet, tiled floor & granite. toilet, shower, Center Bath has Tiled walk-in shower. Chair Height Toilet. toilet, shower, Bathroom has a walkin shower, tiled floor & granite tops. All bathrooms have been upgraded with new cabinets, granite counter tops, Delta Faucets, Chair Height Toilet's and the center bathroom has a floor to ceiling tiled shower. This property is Beachfront. All condos have a view of the Beach & Ocean. NEW A/C & HEATING SYSTEM INSTALLED 2017. Large Front Load washing machine inside the condo. Large Dryer inside the condo. We provide Free Wireless Internet for our guest. Living Room overlooks the Ocean & Beach and we have new Sliding Glass Doors (2014) to access the direct oceanfront balcony. Great View. Stainless Steel Refrigerator with icemaker. 4 Slice Toaster (Bagel Size). Kitchen is well stocked for cooking in. Lots of glassware and other items that you may need. Table seats 4 and the Breakfast Bar seats 3. This condo has two 40 Inch Flat Screen TV. One in the living room and one in the Master Bedroom. The second and third bedrooms each have a 32 inch Flat Screen TV. Cable Service provided by SPECTRUM CABLE. This condo has a stereo to listen to the great Beach music on 94.9 or the oldies on 105.9. We have several DVD players in the condo. 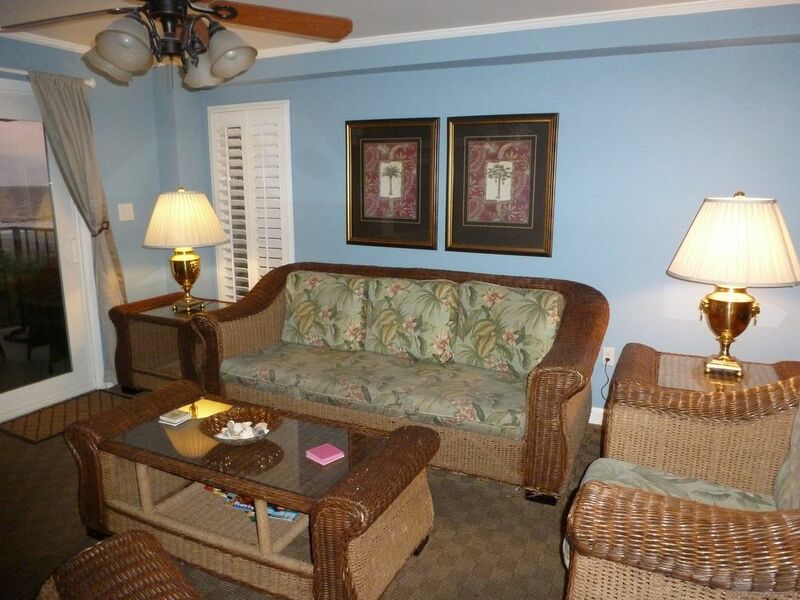 This condo has a large 145 square foot direct Oceanfront Balcony with a table and four chairs and a chaise lounger. We have a great view of the Beach and Ocean. The city park is just 5 blocks away. N. Myrtle Beach has numerous courses in the area and many are within a 5 to 10 min drive form the condo. We have a large oceanfront pool that overlooks the beach and ocean. Our pool is 8 foot deep and we have an additional Kiddie pool for the children. We have plenty of lounge chairs for relaxing. numerous bad experiences as far as that goes, but your condo was perfect. and so did my husband and I, especially the fact that the king size bed was a TRUE king size bed, not two twins slid together. Will definitely contact in the future for MB vacation stays! My family and I stayed at this condo 7/11/15-7/18/15. It's a very well kept condo with a lot of great updates. This was one of the best condos that we have had the pleasure to stay in. I would highly recommend this unit to anyone traveling to the area. We will definitely stay again. Thanks! Todd, thank you and your family for staying with us. I am glad that you had a great time and that you found the condo well suited for your needs. We appreciate you staying with us and look forward to serving you again in the future. I have been to North Myrtle Beach many times, I always try to rent from Tommy Sides. Tommy is always wonderful to work with and I have stayed at many of his rental properties and been happy there.. I love not having to go in and clean the place up. It is always nice and clean when I check in. Some of my other family members have started going to the beach now too and they also enjoy renting from Tommy. He is a good honest man who will fix whatever problem arises if you let him know. I recommend him to all my friends visiting North Myrtle Beach. I already want to go back. Betty, thank you for staying with us again. It is always a pleasure to work with you and we appreciate your business. Hope to see you again next year. We have rented this condo three times, so obviously we are happy here. The unit is attractive, spacious, well-stocked, and in a convenient location. Tommy, the owner, is accommodating and gracious. We hope to be fortunate enough to return in the future. Charlie & Carolyn, thank you for staying with us again. I am glad you enjoyed your stay and we look forward to serving you again next year. It is always a pleasure to have guest like you. Have a great summer and blessings to the both of you. The condo was very well furnished and decorated. It was in a great location and very comfortable. I love the idea of having a bathroom in each room and the view was wonderful. Tommy was very easy to work with and the other people at the TideMaster are very warm and welcoming. We will be renting here again for our next trip. Jeff thank you for staying with us. I am glad that you enjoyed our condo and had a great time at the beach. We look forward to your next visit back to Ocean Drive. We would not recommend this condo to anyone. The kitchen is not well equipped, it had no teaspoons and we had to go buy plastic. Nor did it have any nice pots and pans to cook with. The bathroom ceiling in the second bedroom had caved in and we were not notified in advance of this situation. He had workmen come in to fix it while we were there. Two days before our stay was over an exterminator came in and sprayed while we were there. That evening huge cockroaches were crawling in the living room area. It was sickening and ruined the rest of our stay. We also had to pay extra for sheets and towels and there was a lot left to be desired as to the cleanliness of the condo. Needless to say we will never rent this place again and that is why I am warning anyone else who does. In closing I would also like to state that we were not offered any compensation for all the inconvenience of having plumbers and plasterers coming in and out of the condo bedroom. This is the first time that I have had someone complain about me being proactive and fixing a problem. The issue with the ceiling was a broken pipe inside the wall that ran thru the condo from the roof to the ground level. The water had damaged my ceiling and when notified by our management company of the leak we had to remove the ceiling over the shower and repair the leaking pipe. We have to protect our condo from damage and the units below use. I explained to the renter what had happen when they arrived and that we would take care of the issue as quickly as possible. Thoughout the work being preformed nothing was said about being unhappy. Each and every time I was there I asked if I asked how things were going and was told we are having a good time. Not once was a request asked for additional silverware and pots and pans. Upon receiving this review these items were checked & found to be short, & have now been replenished. That could have been easily done while they were there with just a phone call or email. While we regret the issue with a roach, we spray our property on a regular basis & that is for a reason. We are in a hot & humid environment & once in a while you will get a bug. I do not tolerate them & we are very aggressive. Once again being proactive for this family was not good enough. I assume that they would have rather we not fix items, or spray for bugs. In closing there are just a few things I want to say. The mother walked into the condo & from the minute she walked in started complaining, saying this is not what they had picked out & that the furniture was not upscale ect. I was very taken back & told her that what she was seeing inside the condo was exactly what was posted on line. As she walked away her husband told me that he thought the furniture was very nice. Secondly there were 4 adults, & 1 small child. There are 3 bathrooms in the condo and the one being repaired was the smallest one, yet that is the one that was being used. Not sure why you would not just use the other larger bathrooms as a primary until repairs were completed. In closing I have many properties that I rent & we have hundreds of satisfied guest year after year & I knew that the minute I encounter this lady & the comments she made when she walked in the condo that I had someone I probable was not going to please. All of my other reviews are 4 to 5 stars & she gives me a 1. I think most families will be able to see where the real issue is. No hard feelings. Rates are subject to change. Credit Card Fees are 3.5% for Visa, MasterCard, Discover & 4.5% for American Express. Holidays & Special Events will have slightly higher rates.